Now that The Happiness List is out in the wild, I thought it was high time that I had a go at drawing up my own happiness list. You’d think this would be straightforward but heavens to Betsy, it was difficult. 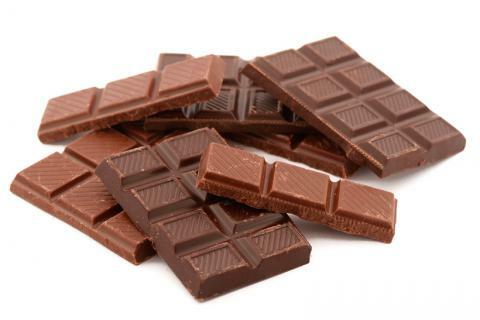 It would have been so easy to just list all my favourite foods but then which one for top spot – chocolate or cheese? Impossible. I’ve done my very best and have written it in reverse order so that you can read it like they used to do on the chart show. You’re welcome. This may seem an odd choice but I did a degree in German and spent one of the happiest years of my life living in Munich. For the record, they really do have an excellent sense of humour – it’s just that it’s even drier than ours so we don’t always get it. Bristol is cool. It’s how London could be if it were smaller, friendlier and stopped taking itself so seriously. I went to university in Bristol and all my best friends live there still. There are so many reasons why Bristol makes my happiness list but the main one is the way that whenever someone gets off a bus in Bristol, they say ‘Cheers drive’ in a chipper south-west accent. I have been going here on holiday for my whole life. I went there before the rich people invaded and brought artisan coffee and branches of Jack Wills. 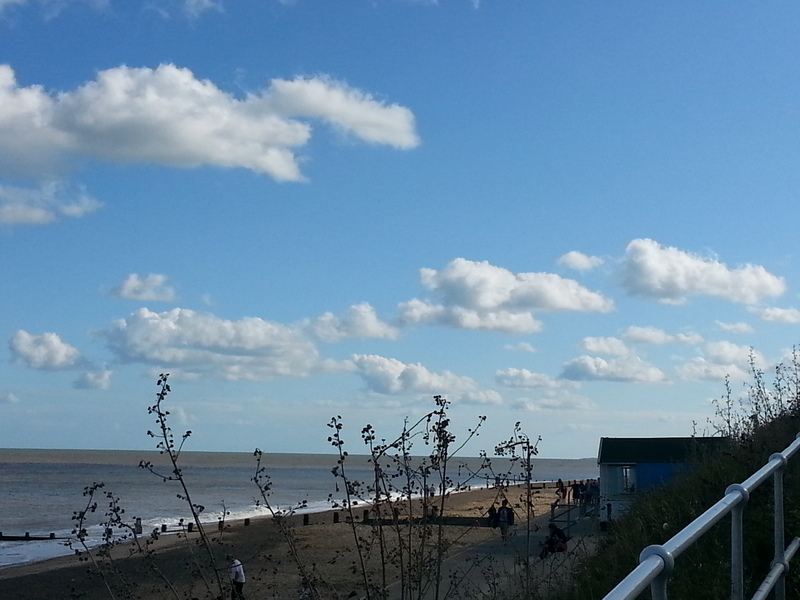 It’s the huge skies, the sea-salt breezes and whole days with the kids on the beach which make it my ultimate happy place. It’s taken me over forty years to fully appreciate the fact that I actually get something out of exercise. It’s restorative and stops me thinking about everything else for a while. I have tried and failed with various forms of exercise. I hated running and failed at football but I appreciate the healing powers of swimming and I love tennis. Regular observers of my Twitter feed will know how much I love my garden. When we moved to our house nearly four years ago, it was a scrappy patch of scrubland filled with buried bottles and sweet wrappers. 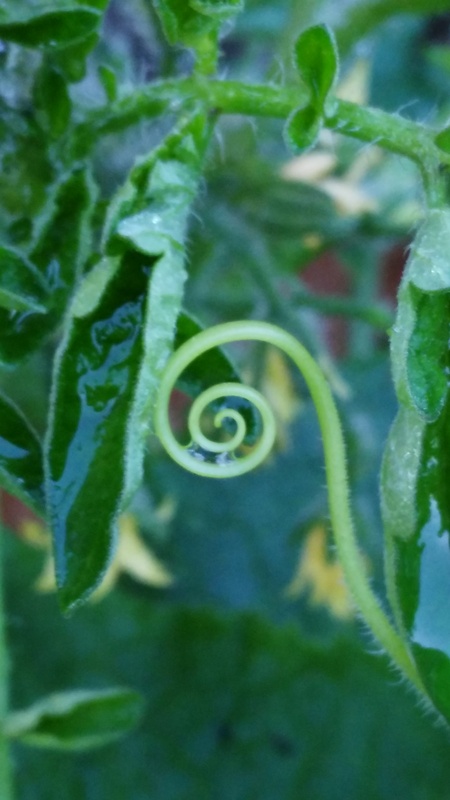 Now we grow tomatoes, cucumbers, courgettes, blackcurrants, garlic, runner beans, and lettuces to say nothing of salvia, achillea, rudbeckia and crocosmia. I even watch Gardeners’ World and follow Nigel the Dog on Twitter. I never knew middle-age could be this good. To be honest, I’m amazed this isn’t at number one because I am essential 75% caffeine. It fuels me but also defines a lot of my social interactions. I am rarely happier than when I’m meeting someone for a coffee. Preferably a Flat White with a lovely almond biscotti on the side. In our house, the debate about whether books or music is better rages on (click here for the post I wrote on this subject last year: Ten Reasons Why I Love My Choir). My husband couldn’t live without music, whereas I favour books. It’s therefore fortunate that we’re allowed to have both. As I’ve said before, singing with my choir is one of the most sublime feelings for me. In fact, I love this so much, I wrote a book about it. I have spent a lifetime reading, selling and writing books so it’s no big surprise that it makes my top three. True, I have bad writing days but then everyone has a rubbish day at work. However, I never tire of reading, discovering and talking about books. They are quite simply the best thing you can own – they furnish your life and feed your soul. I can’t think of anything better than that. If books are the building blocks of my life, comedy is the foundation. From the moment my dad bought me a copy of, ‘The Ha, Ha, Bonk Book, I knew that making people laugh and sharing in that laughter is a truly wonderful thing. Victoria Wood will always be the queen for me but we are living in an absolute golden age for comedy with the likes of Sarah Millican, Katherine Ryan and Roisin Conaghty. I know from experience that when life gets tough (and heaven help us, it’s tough at the moment), finding the funny side gets you through. There’s no-one in life who has the capacity to annoy me more than my family but there’s also no-one who loves me more. My husband, the teenager and the small boy (not the cat) are the three morons who make me truly happy. If they’re okay, I’m okay. All is well. Happiness is assured. I would love to hear what’s on your happiness list – tweet me @1AnnieLyons using #MyHappinessList or leave a comment below. 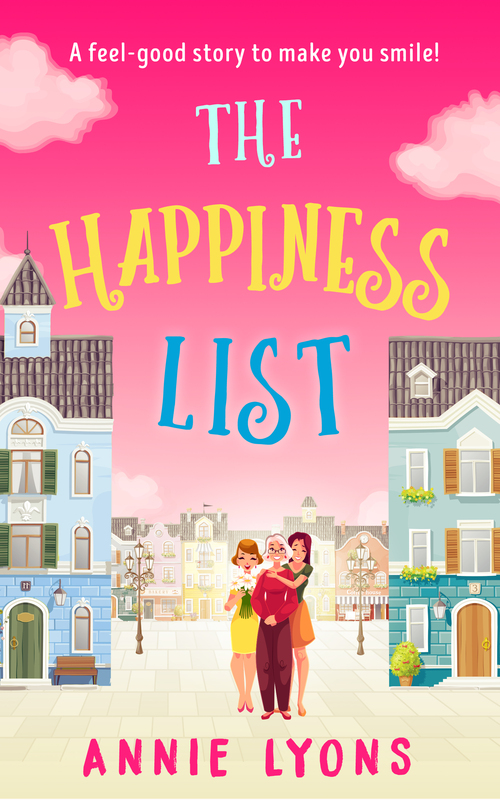 The Happiness List is out today! 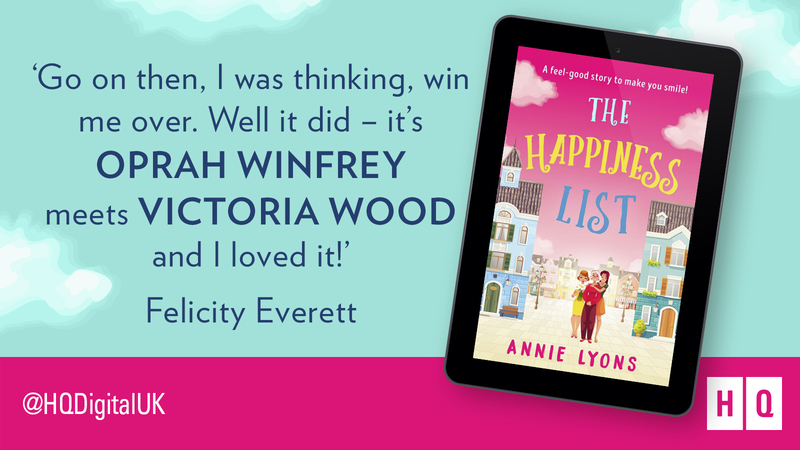 Hang out the bunting, chill the bubbly and grab a family pack of Doritos for The Happiness List is published today! To celebrate, I’ll be running a Q & A on Twitter between 12 and 1 so send me your questions using #MyHappinessList and let’s spread a little joy and nonsense this lunchtime. Plus, this splendid band of bloggers are supporting me with a short but magnificent blog tour. I hope you enjoy reading the book as much as I enjoyed writing it. If you do, please post a review – they really mean the world to us authors. Now I like words as much as the next writer but even I could see that I needed something snappier; a punchy little word or phrase to summarise a book, which can make you howl with laughter one minute and reach for the tissues the next. Please don’t misunderstand me here. I’m not denigrating the terms ‘chick-lit’ or ‘romance’ or ‘women’s fiction.’ These work well for lots of authors and have worked for me too. It doesn’t matter how readers find your books and if these genres have brought them to my stories, I’m grateful. It’s just that personally, I find these genres a bit limiting and not entirely accurate in defining what I write. For one thing, it sounds as if I’m writing exclusively for women. Which I’m not. I have been approached by lots of men (not in that way), who have expressed genuine surprise at how much they’ve enjoyed my stories. Nearly all of them go on to say that they wouldn’t have normally picked up my books. Whether we like it or not, the terms ‘romance’ and ‘women’s fiction’ inevitably put men off. I’ve also encountered men who’ve asked if I write, ‘chick-lit’ in voices which belittled and dismissed my writing achievements out of hand. Don’t worry. I just asked them how many books they’d written and order was restored. You get the point though. So I am over the moon that there’s a new, gender-neutral genre (try saying that quickly) on the block and to my mind it sums up these subjects perfectly. 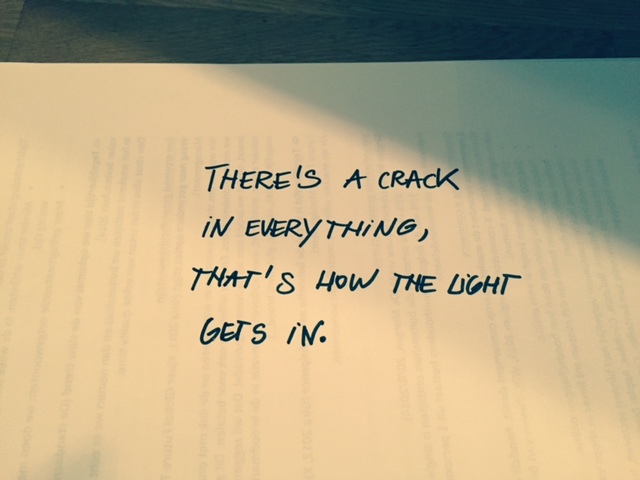 It’s a shiny beacon of hope in the form of, ‘Uplit’. ‘Uplit’, I hear you cry? Yeah, okay, maybe it’s not perfect. It might make you think of those upside-down lampshades from the late nineties. Or as Matt Haig (whose books are often placed under this umbrella) pointed out on Twitter, as an anagram of ‘tulip’ but then, who doesn’t love a tulip? Regardless of the awkwardness of the word, I’m delighted with the definition. These are books which have kindness at their core, which deal with sadness and devastation but which also offer hope and seek to find the good which still exists (it does, trust me) in our communities. For me, this underpins everything I was trying to say when I wrote ‘The Choir on Hope Street,’ and ‘The Happiness List’. They are both set on the same street and tell different stories of communities pulling together, of unexpected kindness and friendship and the hope this can bring. 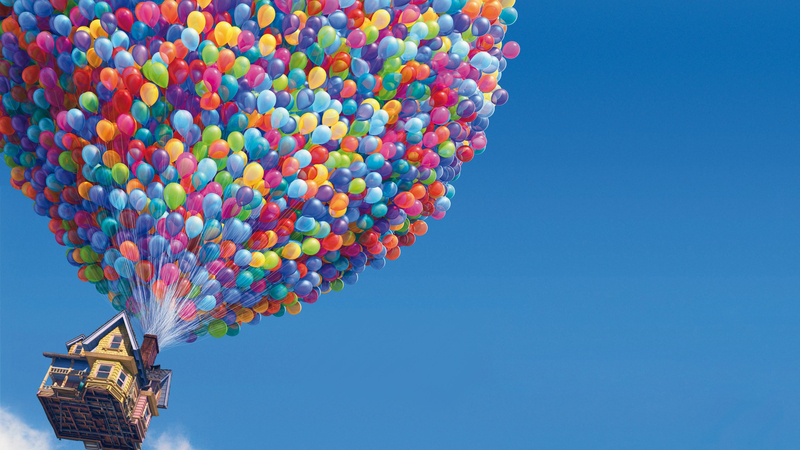 It makes me think of that image of the house in the film, ‘Up’, containing the bereaved elderly man and the little boy as it’s lifted by hundreds of balloons. There’s sadness in this moment but also joy and a soaring hope. In the end, readers need signposts to find the books they love and if ‘Uplit’ is the one that brings them to my stories, I am completely fine with that. 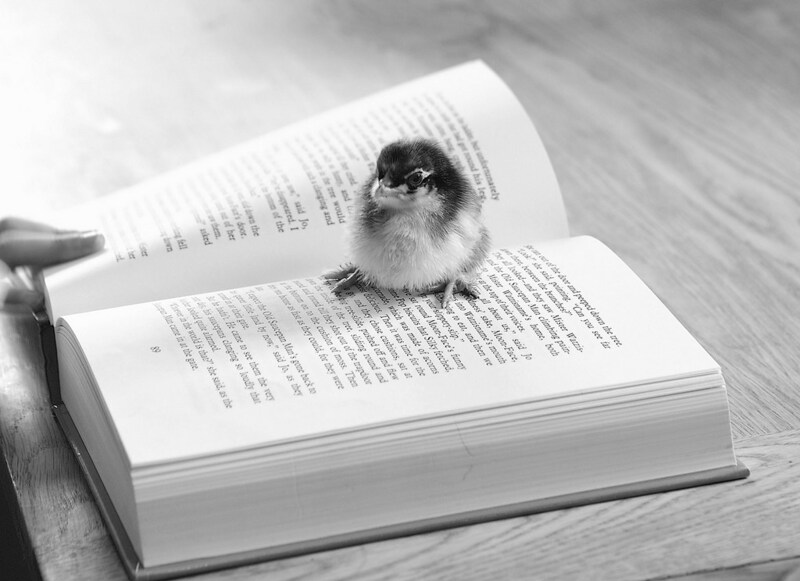 You’ve got a great idea for a book – it’s time to find out where that idea can take you. If you never try, you’ll never know. In this ‘use it or lose it world,’ writing is one of the best forms of exercise for your brain. In fact it is an activity that fully engages both sides of the brain – the right side for the more imaginative side of things and the left for the logical, vocabulary-sorting side. I call that win win. Sharing stories is as old as time and as satisfying as a cold drink on a hot day. Story-telling is particularly important because you are asking the reader to invest in your words and this in turn breeds empathy, which is a vital part of what makes us human and humane. Words are powerful – learning to use them well is a gift and a very useful skill. There is NOTHING more satisfying than creating a world, a character or a story from your brain and your brain alone. 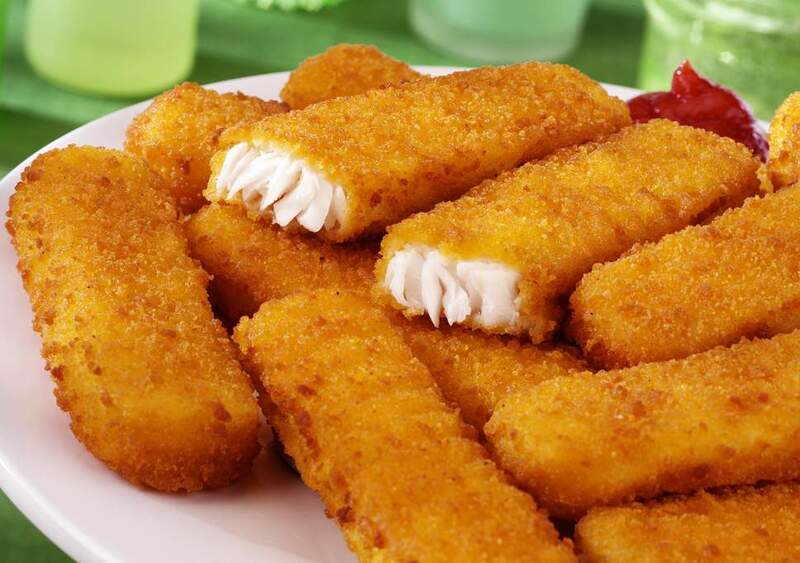 It is pure food for the soul. There is a chance that you might spark an idea, which becomes a book, which ends up as a movie, which brings you millions and a friendship with JK Rowling. It’s a small chance but writers need to dream. 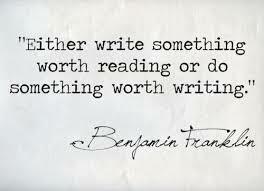 The world needs writers to interpret life, to find the truth and to share it. One of my readers told me that the characters in my books speak to her and for her – they represent her world and tell the truth about it. For me, that is a privilege and reminds me why writing is so important. It has hugely positive and far-reaching effects on your health, self-esteem and well-being. 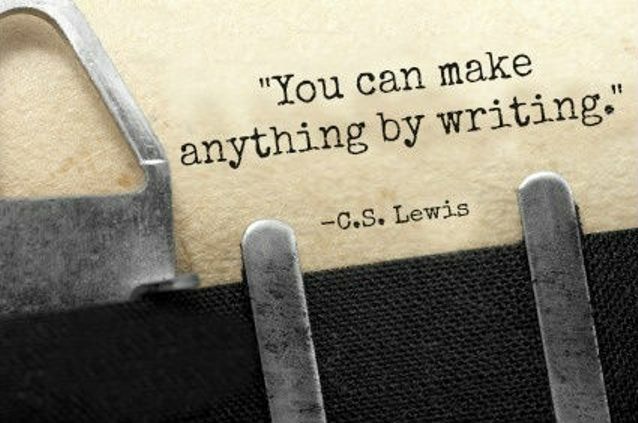 I discovered Creative Writing when I needed it most and can honestly say that it saved my sanity. Writing can be therapeutic – it can enable you to preserve memories, which would otherwise be lost, to purge yourself of certain feelings or just express emotion in a creative and liberating way. It’s fun! Writing for entertainment and pleasure is one of the best experiences in life and if your stories resonate with or amuse a reader, your work is done. Be proud and happy. Grab your notebook and pen and meet me at the library! Dearest reader friends, I’m as excited as a toddler who’s just seen snow for the first time to announce that I have a new book coming in July and it’s all about happiness. Happiness is a funny old thing, isn’t it? We all search for it, sometimes fail to find it and often only recognise it when it’s gone. To be honest, I feel the same about Double Deckers, which in a quirky twist of fate are also a great source of happiness for me. Uncanny, I know. Is happiness something you can learn? And if it is, what would the course which taught you how to be happy look like? 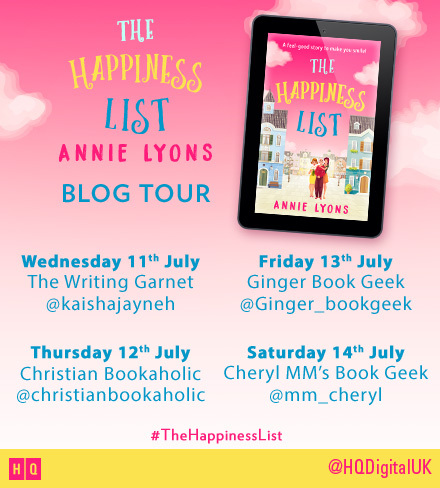 And so, my bookish chums, The Happiness List features my own version of such a course along with three female characters from three very different generations and backgrounds. Each has their own reason for attending the course run by Scandinavian Hygge-fan, Nik at their local community hall. Heather is in her twenties and has just moved to Hope Street, close to where her late mother grew up. 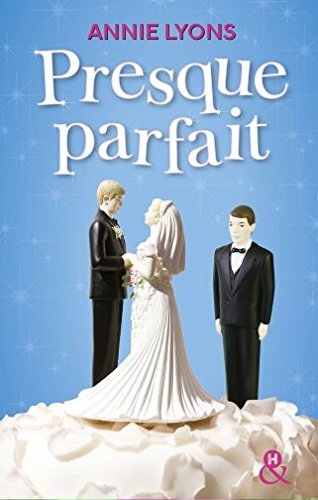 She is convinced that her forthcoming marriage to fiancé Luke will bring her everything she needs in life, if only she can persuade him to spend less time at work. Fran is in her early forties and since being widowed two years ago, has done her best to bring up her teenage son, Jude and ten-year-old daughter, Charlie alone, whilst deflecting her own grief with darkly sarcastic wit. Star-baker and community stalwart, Pamela is in her mid-sixties and is fed up with being taken for granted by her garden-fanatic husband and grown-up children. She’s ready to step out of her comfort zone and try something new. With these three characters, I wanted to explore how people’s versions of happiness change depending on their age and circumstances and also how different generations learn from one another. I loved writing this book because it enabled me to return to Hope Street and tell a new and fresh story about friendship, community and how important they are in bringing us happiness. Like most of my books, I aim to make readers laugh and perhaps shed the odd tear. I wholly recommend the addition of your favourite happy-making snack whilst you are reading and above all, I hope you enjoy it. And if that’s not enough, here’s a sneaky peek of the bright, beautiful cover to bring you just a little extra happiness on this chilly Wednesday. child-free years our definitions of ‘fun’ led to some pretty evil hangovers and one particularly lengthy wait in A&E. Still, we are older and wiser now or maybe just perpetually tired, so these days the proposals tend to be a bit more low-key. And actually I realised that I did. I’m not sure if it’s my age or possibly the age of my children, but I was suddenly aware that I no longer had any hobbies aside from ‘reading whilst my eyes slowly close at bedtime’ and ‘going to the cinema to see films provided they are rated 12A or below’. I had officially become middle-aged and boring. It was time to get a hobby and have another go at this thing called fun. So off to choir I went. From the first second I stepped into the room and we belted out ‘California Dreamin’’ I have loved it. Due a combination of a wonky spine, two children and writing, I have a bad back but I never notice it while I’m singing. After a session of belting out everything from Stevie Wonder to Snow Patrol, my back often feels less tense too. It might be the posture, the breathing or my pretty awesome moves but there’s something about it that is positively healing. In the film of my life, I make an entrance every morning to ‘Feeling Good’ by Nina Simone. Sadly, a combination of factors including my inability to make coherent conversation before the first coffee of the day and the withering response I would receive from my children, makes this impractical. However, I always have a song buzzing in my head. Sometimes it’s an ear-worm, often it’s something fantastic. Being part of a choir means I can now belt these out in the car, shower and supermarket with the legitimate excuse that I’m rehearsing. It’s brilliant. I can carry a tune and I learn a harmony but I am not a soloist. Despite my best efforts in front of the mirror giving a heartfelt rendition of ‘Someone Like You’, I am not Adele. I’m not even Adele’s backing singer but I would give it a go if the call came. I can sing fine on my own but I sing better with my choir buddies. There’s something about catching someone’s eye mid-song and sharing a smile because you’ve got this. You are nailing ‘Uptown Girl’. Billy Joel would be proud. In week three we started to learn ‘Africa’ by Toto. If you don’t know this song, add it to your playlist immediately. There’s a reason why NME ranked it 32 on a list of 50 ‘most explosive choruses’ – it’s choral catnip. It also has a three-part harmony (four if you’re ambitious). I was in group three. We ran through each part and then tried them all together. It didn’t go well for me. I kept getting distracted by the tune, groups one and two and Jeff Porcaro’s impeccable drumming. It was frustrating and difficult. Our MD directed us to an enthusiastic and charming Italian musician’s You Tube channel. He had helpfully recorded each harmony part. I pored over this video and decided that I loved this man. I made my husband (a talented musician himself) practice with me. I played it over and over in the car. And then it went in. Just like that. Like all those lyrics to 80s pop songs that are actually turning out to be quite handy now, the ‘Africa’ chorus harmony, part 3 is indelibly printed on my brain. And it feels good (cue Nina Simone moment). When I was a kid, I used to get nervous to the point of nausea about doing anything in public. Now, I get excited. Again, it wouldn’t be great for anyone if it was me singing on my own but in the spirit of ‘we’re all in this together’, it’s pure fun. Even when it goes wrong. And of course, when it goes right and people clap (an unexpected and welcome pleasure) or indeed cheer, it’s nothing short of intoxicating. Last year, we took part in an event to mark the opening of the new Tate Modern building in London. 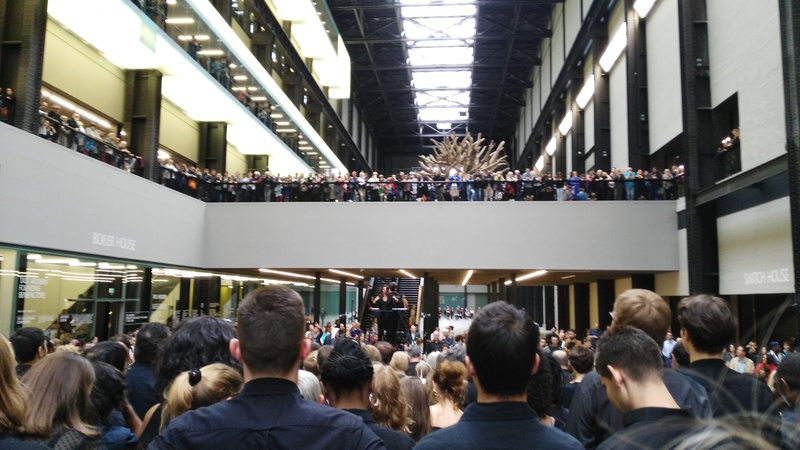 Our choir formed part of a 500-voice London community choir performing a specially composed piece called ‘The Bridge’ by installation artist Peter Liversidge. We rehearsed and performed in the Tate’s awe-inspiring turbine hall with the brilliant conductor, Esmeralda Conde-Ruiz. The piece was weird, wonderful and completely original. It felt incredible to be part of this and even my nine-year-old son (habitually underwhelmed by anything that isn’t linked to football or wrestling) declared it to be, ‘really cool, Mum.’ And it was. Singing at the Tate Modern. As everyone knows (ask Gareth Malone if you don’t believe me), the secret to a really good choir is excellent cake. We have a brilliant resident baker called Lucy (you can check out her rather super cake, book and film blog here – https://keeps-me-busy.com/ ). If Lucy ever left the choir, I think we would be in trouble. It’s simply not possible to channel your inner Dolly or indeed Kenny during ‘Islands in the Stream’ unless you have either eaten or are about to eat cake. The raspberry and Prosecco cupcakes were a particular high-point. 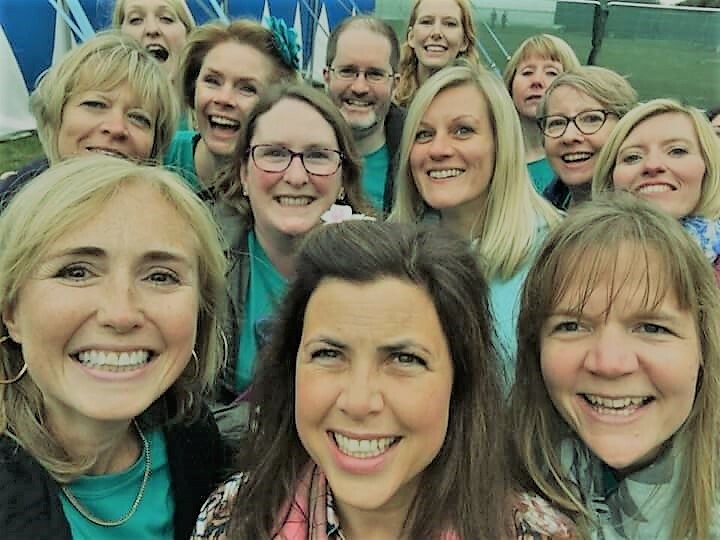 Yes, we kick up our heels at the Tate Modern and of course, when Kirstie Allsop invited us to her Handmade Fair, we said ‘will there be cake?’ and then agreed when we found out there would. But actually, our wonderful founder, Kari set up the choir for the local community. So we sing in our pub, at fundraising events, local fairs and basically anywhere we can if we’re asked. And when something awful happens as it did last year when a local boy and his aunt were killed when a car came off the road during a police pursuit, we come together to try to offer support by singing to raise money for the people who need it. It won’t take away the sadness but music has a way of offering comfort when you need it most. Our founding MD, Kari is a passionate, enthusiastic fizzing ball of energy. Whilst she was running our choir, she inspired, cheered and booted us up the backside when we’re off key. She’s a great dancer and did her best to stop the mum-dancing and get us grooving. She taught us new stuff, she encouraged others to lead songs and she challenged us. Most of all, she made it fun. Very selfishly, she moved to Nottingham in the summer and we miss her dreadfully. Luckily for us, we have not one but two new amazing MDs, who have stepped up and are keeping her passion, enthusiasm and groovy dance moves very much alive. We are one lucky choir. I have met some lovely people since joining the choir. We sing, we chat, we sing some more, we eat cake, chat some more, possibly have another slice of cake and do a bit more singing. It’s the perfect evening really. Add in the occasional Prosecco-fuelled gig and I’m a happy camper. I have found my people and singing with them is the best. Hanging with Kirsty – the cake was excellent. 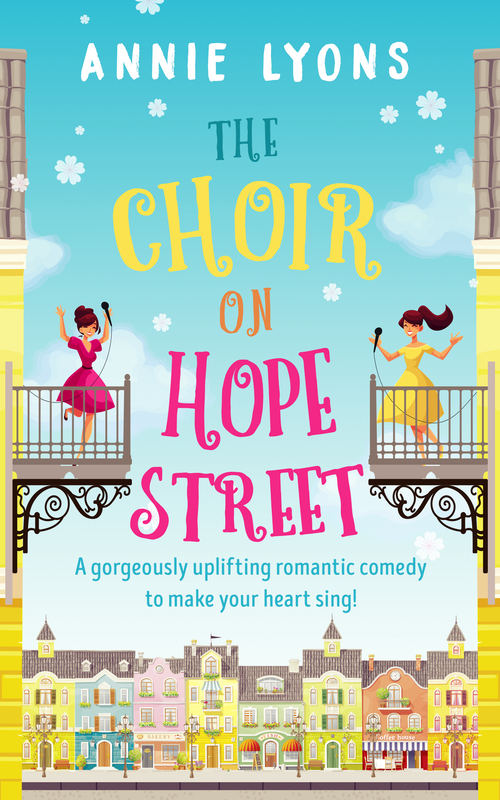 It’s no great surprise therefore that my choir served as inspiration for the The Choir on Hope Street, although I have to add a disclaimer that no choir members were harmed in the writing of this book. The two main characters, Natalie and Caroline form a community choir in a bid to save their beloved Hope Street Community hall. Or rather, perfect PTA mother Caroline forms the choir and drags a reluctant Natalie along with her. And of course, there is a resident choir baker in the form of Pamela and lots of cake because all good choirs need music, friendship and a decent slice of Lemon Drizzle. I wanted to capture the spirit of what it’s like to be part of a choir and the way that music can unite and help people in the most unexpected of ways. 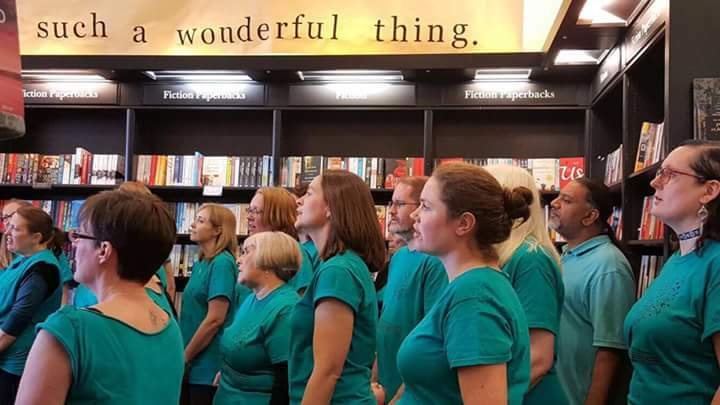 I think this photograph, taken at my book signing at Waterstone’s in Orpington earlier this year, when my lovely choir turned out to support me, just about sums it up. Such a wonderful thing indeed.